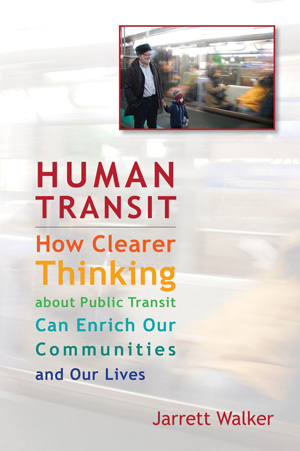 Below is the table of contents of my forthcoming book Human Transit: How clearer thinking about public transit can enrich our communities and our lives. The book will be released by Island Press in November or December 2011. For more or to preorder, see Island Press or Amazon, or my hometown favorite, Powell’s. The complete introduction is available online here. This chapter defines transit and its role in the city compared to other transport modes, and proposes the concept of personal mobility, a measurable freedom, as transit’s most fundamental product. It takes me where I want to go. It takes me when I want to go. It’s a good use of my time. It’s a good use of my money. It gives me freedom to change my plans. This chapter defines the main elements of the transit product (speed, frequency, span, reliability, etc.) and explains how each serves those various demands. An introduction to five of the most common conceptual mistakes in transit planning: map-reading errors, motorist’s errors, box errors, polarization errors, and choosing words with unfortunate connotations. The most basic geometric concepts in transit. Should transit lines be I-shaped or U-shaped? And why do people get so excited about loops? How far apart should transit stops be? This chapter explores why this technical-sounding question is fundamental to almost everything you care about. 6. Peak or All Day? Does your transit agency’s thinking begin with the peak commute, or with an all-day pattern of service? Why this matters. Frequency is oddly invisible to the non-rider, yet it’s sits at the core of almost all transit outcomes. This chapter explores the urgent challenge of making frequency visible, in marketing, planning, and policy making. Transit speed is mostly the absence of delay. This chapter surveys the delay types, explains how planners address them, and how we might think more clearly about them in making policy. This chapter confonts recent claims that development density is not as important to transit as we thought, and sorts through some of the confusing ways density can be measured. Transit can do good work at many density levels, but density — properly measured — is still fundamental to transit outcomes. Every city or region has some areas where transit demand is high and others where it’s lower. How can transit agencies reach consensus on how to apportion service among these areas? 11. Can Fares be Fair? An exploration of the hard choices around fares, and how smartcards are resolving some but heightening others. Can fares be “fair”? Are you sure you want them to be? Nobody likes to get off one transit vehicle and get on another — an act known as transferring, changing, or connecting. This chapter explains why connections are inseparable from many other things we value, including frequency and simplicity. If we accept the need for connections (also called transfers), what does this mean for design? This chapter explores the common types of network structure that arise from this problem, and then considers how connection points can galvanize great urban places. Whenever you choose a location, such as for your home or business, you largely determine what transit can do for you. When cities and developers decide where to build things, they profoundly impact the potential for transit in the city as a whole. This chapter explores how to make these decisions more consciously, as individuals, organizations, governments, and developers. The physical layout of a community or region is an overwhelming factor in determining how relevant transit can be, so in that sense, this is the most important chapter in the book. The car-oriented suburban boulevard has much more transit potential than it seems. This chapter explores the special role transit can play in healing the most troublesome features of fast boulevards, and re-creating them as humane and functional places. The chapter ends with a vision of North America’s most boulevard-based city, Los Angeles, in a future when walking, cycling, and transit all have adequate space alongside the private car. It’s a nice place, and one where you can be sure of getting to a meeting on time. Clearly, the total planning problem requires synthesizing land planning and transport planning, including transit. It’s pointless to try to tear down the walls that separate these professions from each other, because each has unique expertise that must be valued. Instead, the key is to create clear conversations at the points where the professions intersect, and for each to provide just the right tools to support and inform the other’s work. A summation of the book’s key themes.